Bulk Pancake Mix From Scratch Recipe! 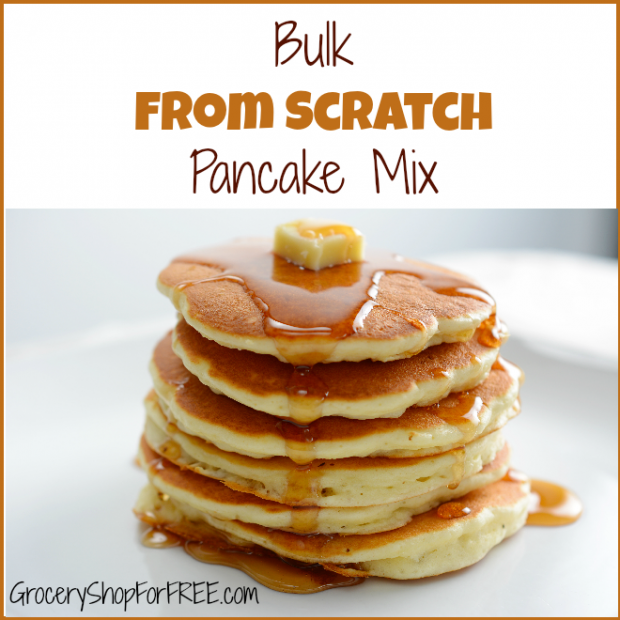 You are here: Home / Recipes / Breakfast / Bulk Pancake Mix From Scratch Recipe! Making homemade recipe mixes is a great way to save money. We all know that the boxed stuff is full of preservatives and unknown ingredients. This Pancake recipe from scratch is very easy to make in bulk and so nice to always have on hand! Mix all of the ingredients together really well. Store in an airtight container in a dry location. In a large bowl mix egg and milk. Add the pancake mix. Stir until combined. Pour about 1/4 cup pancake on a hot skillet. Flip pancake once little bubbles start to appear. Yields 6 pancakes. If you’re using it for a camping trip, go ahead and mix up the wet and dry ingredients and put them in a pourable container and keep cold until use. Remember when you go to use the pancake mix to stir the dry mix before measuring. The ingredients may settle while sitting on the shelf. Renae is a married working mom of two boys. She is the author of How to Have it All and writes about Kroger Deals, Easy Recipes, Life With Boys and so much more. Join her as she journey’s through motherhood juggling work, raising kids and saving money. When our boys were young, I’d make up a BIG batch of pancake mix from scratch comparable to yours here only much more. But I’d also use powder milk to equal the liquid milk since it was harder to keep the wet milk on an extended camping trip. We always had eggs with us to add, but so much easier to just add water to the mix for the pancakes. Awesome! Thanks for the tip! That would be a great camping trip item!